We made bacon for our brunch on Sunday. I never know what to do with the remaining grease. Typically I dump it out in the garbage. This time just before dumping it out I paused. What could I do with it all? Besides frying other foods in it....not my first choice....there isn't much else to do with the excess fat. Maybe it was all the tweeting birds and the gust of cold air that followed my kids as they came running inside that gave me idea. Or maybe it was a memory. In that brief moment I decided the best use for the fat was to make suet. 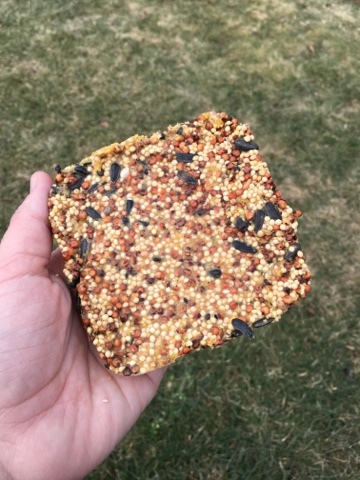 My grandmother used to make suet for the birds all winter long. I faintly remember it being pretty easy to do. 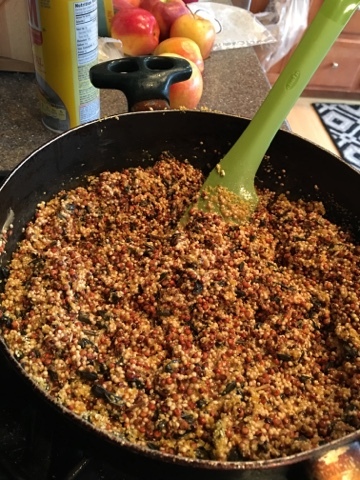 I returned the pan to the stove and set to work making bird suet. To the remaining bacon fat in the pan I added 1 cup peanut butter. I slowly heated the mixture on low heat until the peanut butter and bacon fat were completely smooth. I turned off the heat then added 1/2 cup cornmeal mixing well. Stirring the mixture I added about 4 cups birdseed. If the mixture is runny add more cornmeal. The warm suet should be the consistency of wet sand. Once the mixture started to hold its shape it was ready to be put into molds. I used my Ikea Pruta food storage containers. I used 4 containers in two sizes. One large 5x5x2", and three 3x3x2" containers. These food containers were the perfect size and shape to accommodate my square basket suet feeder. I let the suet cool overnight in the refrigerator. The next afternoon I tapped the closed container, top side down, on the counter until the suet slid out. Unlike the store bought brands this suet is more prone to melting on your hand. And it smells so much better. I have no idea what is put in the kind you find at the store. 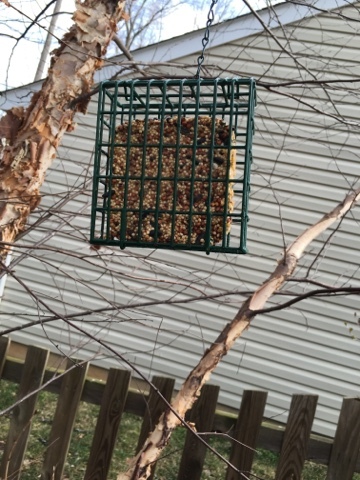 My suet feeder fits the larger 5x5x2" square perfectly. The smaller squares as shown in the picture will fit too but does not fill the entire feeder. I was curious to see how the birds liked it. The suet I put in the feeder first was the smaller square. I held my breath as I watched the first curious birds to visit the feeder. The juncos came first then the finches. Both were exceedingly pleased with the new suet. I left the window and went about my day. A little while later a pair of Cardinals discovered the suet. I learned this as I heard an incredible amount of bird squabbling outside and went to investigate the situation. I watched the disagreement unfold. From what I noticed it looked like that multiple birds found the suet to be quite a treat. The Cardinals were guarding the tree trying to prevent others from gaining access to the feeder. At some point they all worked it out and every bird was able to have its turn feeding. The suet was gone in a few hours later. Gone as in it looked like I never put a thing in that feeder. Meanwhile the other feeder with the suet I bought at the store was left untouched. Which really makes me wonder what exactly is in the store suet. No matter. 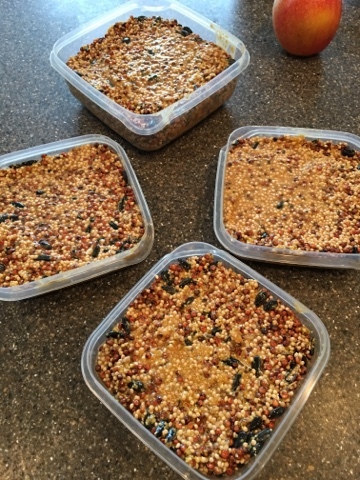 I think making suet is going to be the route I take from this point forward. The process took little effort and the result was far better than expected. I think the homemade version has to be better for the birds too.